Luke Asked: What is this about? My good mate Luke asked me a question this morning by email. “What is the 10 City Bridge Run actually about?” It is a good question. Here is an answer. The central question that the 10 City Bridge Run seeks to address is: “How can you build a bridge to help close the gap on extreme poverty?” A response requires to you think and feel, as much as to act. This is part of a bigger movement about social impact. In this movement, we are each playing a small part in a bigger change. The 10 City Bridge Run is a small part in a well-established ecosystem of other initiatives. We all should know that extreme poverty is a problem. There is enough news and branding around the issue. But do we know the extent to the problem, or do we know how we might make a difference – a real difference- aside from donating money to charity? The 10 City Bridge Run presents a global challenge. There is a physical challenge – the 10 sub-marathons across 10 countries, which is more of a symbolic act through a tough and demanding journey. The bigger challenge, the real challenge, is asking people to engage intellectually; asking people to engage emotionally and take action. Small actions. Like taking a photograph of others building a bridge. Is it possible? Does it matter? Can one person on their own make a difference? (I would suggest the answers are Yes. Yes. and No.) And these answers are reflective of the bigger questions facing humanity on the issue of extreme poverty. It is a complex issue. I think it starts with building a bridge to help close the gap on extreme poverty. You might be doing this already, and if so please show us what that looks like by capturing that in a photograph. There are larger global forces at work. Is the global financial system broken, at least in part? This is the importance of passing a petition to the G20 Summit leadership. Will the petition make a difference? 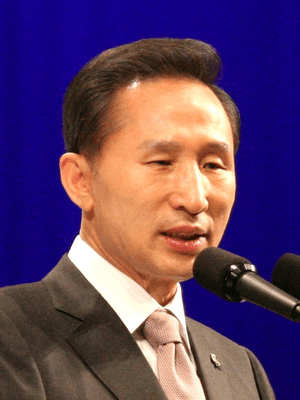 Will President Lee Myung-bak acknowledge the receipt of the petition? There is only one way to find out, and that first requires the collation of 24,000 photographs online. This entry was posted in Awareness, Extreme poverty, Petition and tagged Extreme poverty, Millennium Development Goal, Petition.